According to legend and some historians, by making a stand in the Thermopylae pass 300 brave Spartans valiantly saved the day for the entire Greek army in the face of a Persian force of overwhelming strength and manpower. More than 2,000 years later some 11 million Greeks might be considered to have carried out a rather similar operation by single handedly facing-off a massed horde of frantic global speculators on behalf of the entire Euro Area population – at no mean cost to themselves in terms of wealth, employment and general well-being. Or at least that is the conclusion which could be drawn from reading through the latest self-critical review issued by the IMF dedicated to the lessons which can be learned from the to-date handling of the country’s deep economic and social crisis. 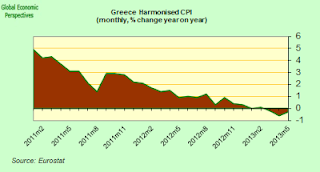 The document, entitled Ex Post Evaluation of Exceptional Access Under the 2010 Stand-By Arrangement (henceforth referred to as the Evaluation Document), does not mince its words, and suggests that Greece suffered a worse than necessary recession due to the reluctance of Europe’s leaders to agree on debt restructuring from the outset. The reason for this reluctance is obvious with hindsight, the Euro Area was institutionally ill-prepared for the kind of crisis which was unfolding while the interconnection of the European capital markets and the banking sectors meant the financial systems of a number of other European countries were at risk. The contents of the Evaluation Document were widely reported on in the press (see for example here), and produced a swift response from EU Commission representatives, including an “I don’t think it’s fair and just that (the IMF) is trying to wash its hands and throw dirty water on European shoulders,” from Economic and Monetary Affairs Commissioner Olli Rehn. The little phrase that caused all the problems was the report’s assertion that “An upfront debt restructuring would have been better for Greece although this was not acceptable to the euro partners.” Obviously, when a dispute becomes as public as this, something, somewhere is going on. Trying to fathom what it was I couldn’t help noticing that the publication of the Evaluation Document coincided almost exactly in timing with the issuing of the Fund’s latest report on the current (rather than the initial) Greek programme – The Third Review Under the Extended Arrangement Under the Extended Fund Facility (what a mouthful that is, henceforth the Third Review) – where curiously the international lenders let slip the significant little detail that next year Greece is expected to have a funding shortfall of some 4 billion Euros. Almost immediately denials that any kind of talks were ongoing about any kind of forthcoming debt pardoning for the country started to surface in Germany, (or see here). Now all of this may sound – at least to the uninitiated – like a load of old bureaucratic mumbo-jumbo, but actually there are a number of key statements here which may help to put the recent internal Troika tiff in some sort of broader and more intelligible perspective. Sometimes in order to get to grips with a highly complicated argument thread it helps to go to the endpoint and then work your way back. It also helps to bear in mind that the recent Evaluation Document is as much about the future as it is about the past – and in particular the scenario which will come into play in 2020 and 2022 when the current programme’s debt to GDP targets are expected to be achieved. The cited paragraph talks about three issues: the macroeconomic outlook, the commitment of euro area member states to support Greece and keep the debt on the programmed path as long as Greece adheres to the programme’s requirements, and the danger that should the programme go “irretrievably off track”, and euro area member states not give the necessary support then the country’s capacity to repay the Fund would clearly be insufficient – ie the IMF would be left holding the can, and Fund employees would be faced with the complicated task of explaining to its non-European members why losses had been incurred. So now I understand the nervousness a bit better. 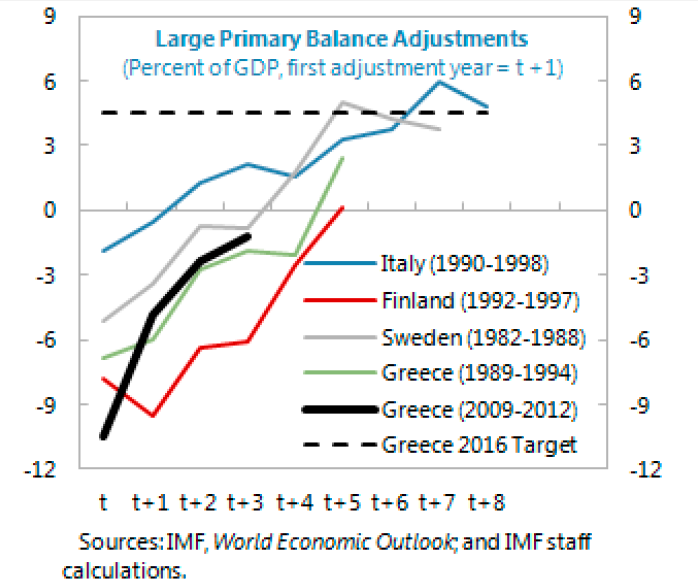 Crudely put the position is this – as long as the IMF continue to write reviews stating the Greek programme is on track then the euro area member states are on the hook to make up any shortfall in Greek debt performance. This is a commitment they undertook during negotiations on the second bailout agreement. Complicated isn’t it? That is why the rule of starting out from the assumption that nothing is ever exactly what it seems to be is normally a good one to work by. 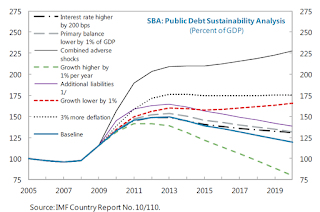 What is obvious from reading through the documentation is that the IMF is keen to highlight the guarantees given by Greece’s euro area peers at the time of setting up the Extended Fund Facility (2012) that “adequate support” would be provided to bring Greece’s debt down below 110% of GDP in 2022 (ie that there would be some form of debt pardoning) should the country comply with the terms of its programme and the debt dynamics still not turn out right. Since we now have a track record on all this, and since staff economists at the Fund have also recently conducted a debt sensitivity analysis which came up with the finding that given slight under-performance on GDP and inflation outcomes the debt could still be as high as 147% of GDP come 2022 , the issue is no mere trifle. This is, in my opinion, why so much emphasis is now being placed in Washington on the fact that Greece’s short term interests were to some extent sacrificed for the greater good of the eurozone, a justification which may make the bitter pill of Euro-partner losses on their loans to Greece easier to sell to their respective electorates. 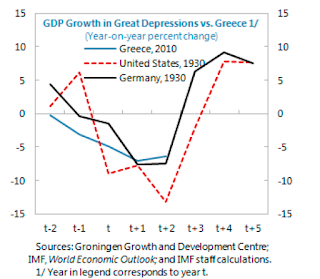 Greece’s recession has been one of the deepest peacetime recessions ever experienced in industrialized economies, and bears comparison with the great depressions of the 1930s in the US and Germany (see chart prepared by the IMF below). Overall, the economy contracted by 22 percent between 2008 and 2012 and unemployment rose to 27 percent; youth unemployment now exceeds 60 percent. As domestic demand shrank across all areas, net exports provided support largely through shrinking imports. 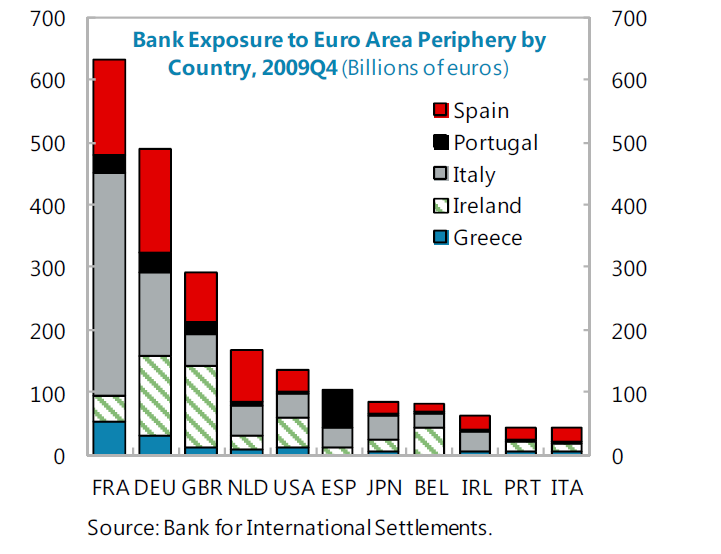 Indeed as opposed to other countries on Europe’s periphery exports actually shrank in Greece in both 2011 and 2012. The issue this raises is was such devastation really necessary in a country participating in a currency union which could have expected support from other participants? Naturally the country “cheated” on its partners, and sacrifices were inevitable but surely a more pragmatic and equitable solution could have been found. Simply punishing a country for what is perceived to have been “wrong doing” accomplishes little and may put a great deal at risk, including amongst those not directly involved. One of the key points to note here is the observation that the program only ran through mid-2013. This is a knock-on consequence of the type of program originally set up (the so-called Standby Arrangement – or SBA). SBA’s are by their very nature designed and intended for short term liquidity support prior to a reasonably rapid return to market access. 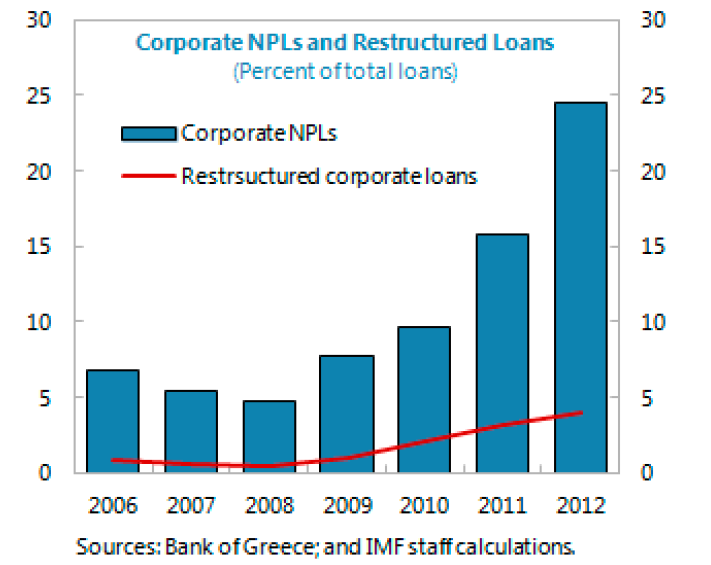 But Greece’s needs, as is now obvious, were longer term and involved solvency issues. Had a decision been taken at the outset to set up an Extended Funding Facility (the 2012 program is of precisely this type) then the time horizon could have been longer, but part of the reason an EFF was not chosen was because the solvency issue was not recognised and debt restructuring was not on the table, so the argument at this point becomes somewhat circular. That is to say, had the will been there at the outset to use an Extended Funding Facility and had the realistic view (recognized with hindsight) that debt restructuring was inevitable been taken, then the Greek fiscal correction would still have been significant, but more extended in time, and with less overall damage to the economy’s private sector. The social and economic consequences of the over ambitious fiscal correction have gone well beyond the downsizing of the country’s bloated public sector, and no part of Greek society has been spared. Among Greek households the fall in disposable income between 2009 and 2011 nearly doubled the previous debt-to-disposable-income ratio (which rose to 96 percent – higher than the peak observed in Latvia). Falling property prices have raised mortgage loan-to-value ratios from around 70 percent on average before the crisis (lower than in European peers) to close to 90 percent in 2012 (currently higher than even in Spain). House prices fell by 11.8% in the year to the end of March, according to the residential price index published by realtors Knight Frank following a 9.8% drop a year earlier. For a country which didn’t really have a property boom before the crisis this is very striking. All this distress and impairment naturally creates problems where previously few existed. The Euro firewall building process meant that most of Greece’s sovereign debt risk was transferred from other European banks to Greek ones, with the consequence that when the debt restructuring finally did come these banks all needed recapitalizing by the state leading the country to have to borrow yet more money to pay for this. Now that the only external imbalance correction process is what the IMF calls the “recessionary path” (rather than a more comprehensive internal devaluation – see below) these same banks are being faced with substantially more losses on their general loan books, possibly leading to the need for yet more recapitalization, and so on. “Macroeconomic developments are broadly as expected. The economy is rebalancing apace: the current account deficit is now shrinking fast, by 6½ percent of GDP in 2012; the competitiveness gap has been reduced by about half as last year’s labor market reforms are facilitating significant wage adjustment; and deflation is finally setting in“. – IMF Third Programme Review (my emphasis). 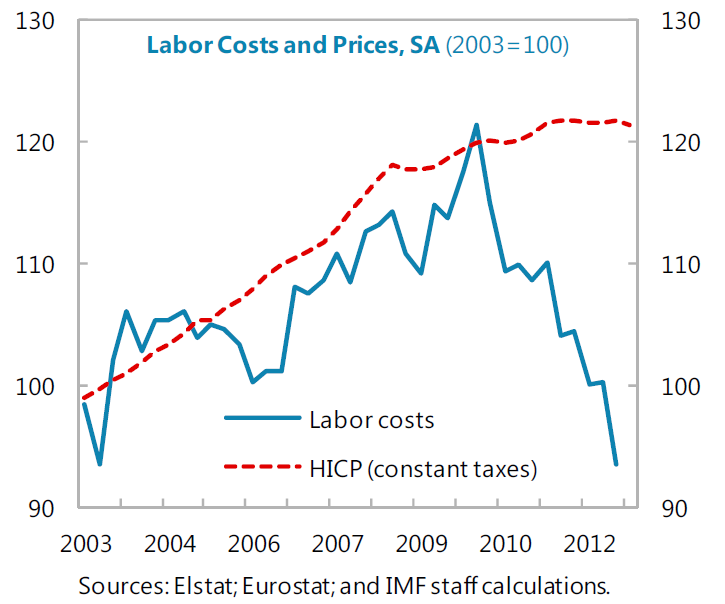 The striking thing, leaving aside the issue of definition, is that the IMF actually seem to welcome the fact deflation is finally arriving in Greece – due to the competitiveness impact it will have on the Greek price level. But it is here I think that one can discern some sort of difference of opinion within the Troika itself. It seems likely that the IMF would actually agree with Mario Draghi that Japanese-style deflation is probably not on the cards in Greece at the moment (although given the depth of the country’s problems and the fact that the countries workforce has now started shrinking – due to demographic shifts and emigration – who the hell really knows, I certainly wouldn’t put my hand in the fire one way or the other on this one). So why might the other parts of the Troika – the EU Commission and the ECB – be more nervous about the consequences of this drop in the price level? They are concerned about the impact on Greek debt dynamics is the obvious answer. This drop in prices is now seen as essential and inevitable by the Fund, but is still to some extent being resisted in Brussels and Berlin. 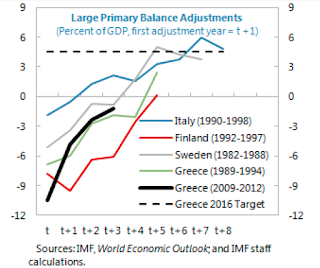 Again, the reason for the reticence is obvious, “we’re on the hook” – remember, if Greek debt is above the 110% of GDP target in 2022, or reaches levels in the intervening years that make this level obviously unattainable, for reasons of lower than anticipated GDP or price growth then the Euro Area peer countries are committed to making up the difference. In the Third Review the Fund goes even further on the basis of a new Debt Sustainability analysis – “If nominal growth averages 1 percent lower than the 4 percent baseline projection, debt will be 134 percent in 2020 with an only modest declining path thereafter“. 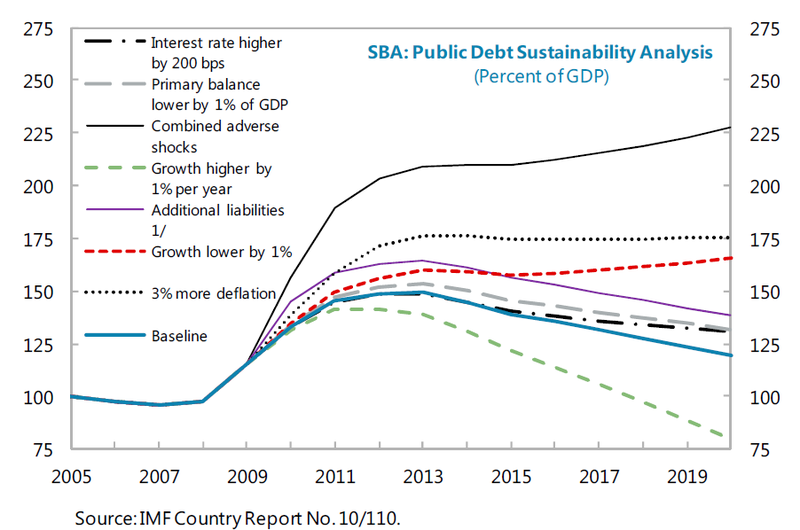 That is to say, if the sum of GDP growth and inflation is 1% less than forecast in the baseline scenario debt will rise substantially. According to Citi’s Chief Economist Willem Buiter, the man who coined the term Grexit, the possibility of Greece exiting the euro zone has receded “markedly” in recent months. “We still believe that there is a fairly high risk of Grexit in coming years, but no longer put it in our base case at any particular date,” Citi said in a research note co-authored by Buiter published in May. Reading this assessment at the time of its publication the argument seemed reasonable to me. But after 48 hours of poring over IMF documentation on the country I am no longer so sure that this conclusion is as solid as it seems. My feeling now is that, despite Buiter’s recent pronouncements, Grexit may well come rapidly back on the agenda after the German elections. I think markets are soothing themselves with an overoptimistic expectation of how committed German politicians are to moving towards banking and fiscal union – Draghi bond buying at the ECB is another issue, but the Greeks by and large don’t have bonds to sell, they just have debt obligations to the official sector. Put another way, as Wolfgang Munchau argues in this week’s Financial Times, “The OMT is not designed to address the solvency problems of various private and public entities in the eurozone”, and Greece’s coming problems are surely of the solvency and not the liquidity kind. Looking over and over again through the numbers the IMF put forward it is clear to me that there is really very little wiggle room left on Greek debt dynamics, and that the IMF are fully aware of this as their Debt Sustainability exercises demonstrate, hence initial attempts to distance themselves from EU institutions in the Evaluation Document. The move reminds me of one of Leo Messi’s attempts to lose his markers while languishing near the edge of the penalty box. One swift lunge and its in the net. Now one possibility which lies before us is obviously that the IMF gives the country a red flag in a review. That wouldn’t be so difficult given the way Greece works. Yet actually, for reasons discussed in the introductory section to this piece, the Fund has precious little interest in doing this, since the country’s Euro peers could then simply walk away from their funding obligations and the IMF would be last man standing on the debt, a situation they repeatedly stress they are anxious to avoid. Nonetheless, let us assume they do throw up a red flag, what would be the consequences? Well, not another EU backed aid programme surely. The red flag would mean the issue of possible Grexit would be directly back on the table, since core Europe would surely be extremely reluctant to accept politically unpopular losses for a country that wasn’t complying, and it is hard to see what the solution to ongoing funding shortfalls coupled with non-compliance would be if it wasn’t euro exit. So now let’s assume that the country gets a series of continuing green flags, but that nominal GDP performance is less than projected in the programme’s baseline scenario – it may not be politically correct to say this, but it is hard not to get the impression that the inflation and growth numbers for 2015 to 2018 (showing nominal GDP growth of around 4.7%) have been devised explicitly to bring Greek debt into the region of 120% by 2020, at least on paper. 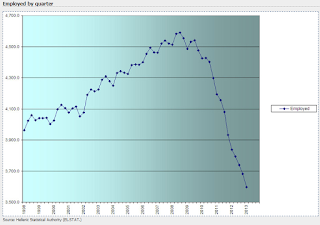 The probability of under-performance is thus high. Cognizant of this looming difficulty the Fund seem to be already attempting to force the issue by looking for a 4 billion Euro down-payment on their commitment from the Euro partners in 2014. Then, supposing they wanted to accelerate the Euro partners Greek bail-in process they would only have to revise down their post 2014 inflation and GDP forecasts to make even more money needed quite quickly. But, if we think about it a bit, the political logic for ongoing debt pardoning in Greece by other EU member states isn’t especially clear given that Italy, Portugal, Ireland and Spain could all easily have debt levels over 110% of GDP come 2022. 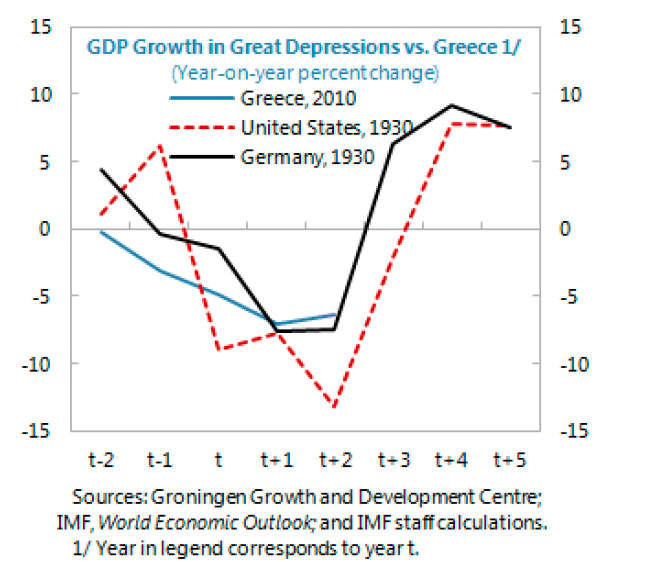 So how can you justify making Greece a special case in the positive sense? I think the more likely outcome is that core Europe will try to wriggle out of its obligations following the German elections, and that this move will lead to a surge in uncertainty about Greece’s future, with Grexit once more becoming an openly discussed option. Great analysis. But isn’t the whole point of shifting the debt sustainability issue beyond the German elections that it will become less politically costly for Angela to get out the purse? or maybe not, ignorance is bliss. Definitely, and this is what many market participants are assuming. Some hedge funds are even buying Greek bank bonds assuming they won’t be “bailed in” when bank recapitalisation comes. But how deep are Germany’s pockets? Will they stretch to pardoning debt in Greece, Spain, Italy, Portugal and Ireland? This is the isssue I am raising. Greece is in a unique position, since it is now openly recognised that the country’s problems are solvency one (debt sustainability) not simply liquidity (market access at reasonable prices) ones. Not only that, the IMF got the EU to agree to UNDERWRITE future Greek losses should the programme implementation prove to be adequate (as, for example, in Portugal, which is hardly outperforming). Progressing adequately will be sufficient. And as I try to argue the IMF has now no incentive to give any other verdict. It’s called moral hazard. These losses, as I try to argue, will go well beyond the mere 4 billion Euros identified for 2014. 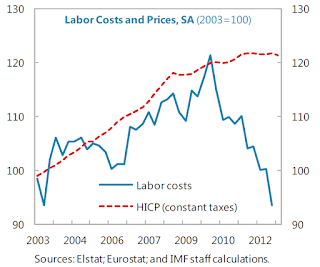 In fact, as the IMF recognise, the absence of HICP adjustment means Greece is a long way away from getting sufficient competitiveness to have exports alone pull the economy as incomes fall and the domestic economy contracts. So the Greek economy has been turned into a loss making machine out towards the horizon – are Finland, the Netherlands and Germany willing to keep subsidising Greece over such an extended horizon? And remember we are no longer talking about lending more (that is only relevant in liquidity cases) we are talking about accepting losses (solvency) on a continuing basis. I see nothing to date that convinces me core Euurope is ready for this, even if it could afford to foot the bill. They are, well and truly, “on the hook”. In addition, the other countries – Spain, Ireland, Portugal and Italy – who will probably need future debt restructuring are only currently being offered a liquidity programme (the ECB’s OMT). This is where attitudes to Greece were in 2010. Once the fact that these countries are facing solvency problems too is openly recognised then the bill will become very, very large. And Europe’s leaders can scarcely offer worse terms than they offer to Greece – except for the Thermopylae argument, which would be a real turn up for the books if it were used. A lot of thinking will have to go on in Berlin before deciding on whether or not to bite that bullet in the autumn. 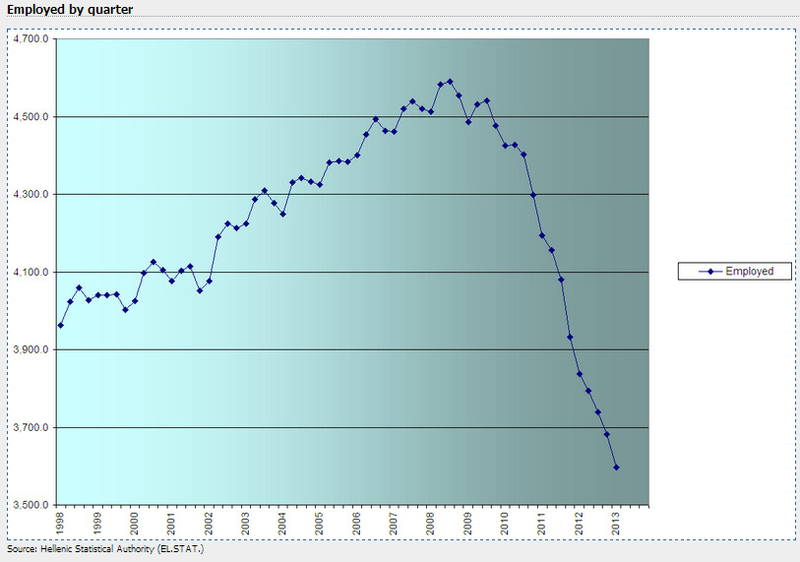 And we haven’t even started to talk about the risk factor represented by Abenomics. Pingback: The Greek public broadcaster showdown, and when do people finally snap? Great analysis. Now, if you would kindly take three days to pore over the China data…. Excellent post. I agree that once Germany’s September elections are out the way, things could change very rapidly. Cyprus is also clearly unhappy about the terms of it’s bailout given Prime minister Anastiades’ statement earlier this week. My money is on atleast one country exiting the Euro before the end of 2014. Great stuff, Mr Hugh. Would love to read your thoughts on China. This is a interesting article to read after some time has passed. Especially with the recent events of the government change in Greece and with major elections coming up this year across Europe.